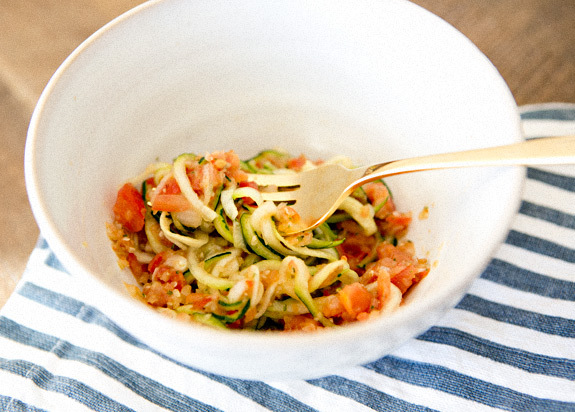 zucchini pasta, another raw favorite! 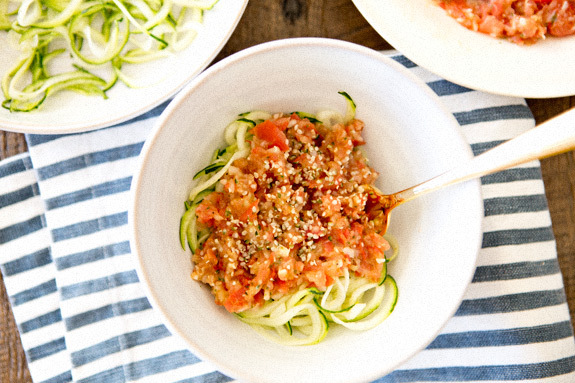 first things first- a spiralizer! this is the one i purchased from amazon and it’s decent. i wanted something that didn’t have a lot of bells and whistles, mostly because cleanup is my least favorite part of cooking. this one does the trick, although i do wish it made the spirals just a bit meatier. 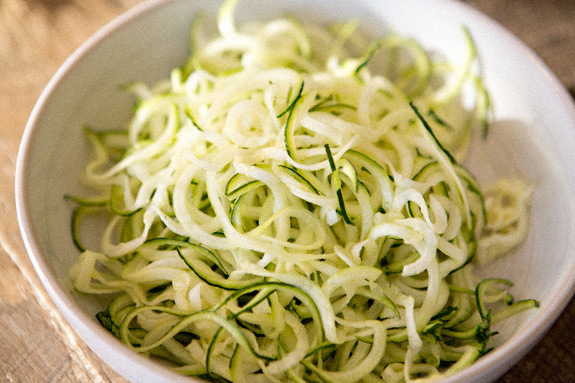 *bonus- using a spiralizer is reminscent of using an easy bake or a snoopy snowcone maker. YES! -in food processor mix the garlic, onion (use a little less than half, add more when you’ve tasted it), dates, basil and a splash of olive oil. pulse until it’s almost a paste, scraping down the sides of the processor as you go. it’s pretty sweet with the two dates, so add less if you don’t care for a sweet sauce! – you have your pasta, you have your sauce, you know what to do from here. and sprinkle on a few hemp seeds for garnish if you care to! 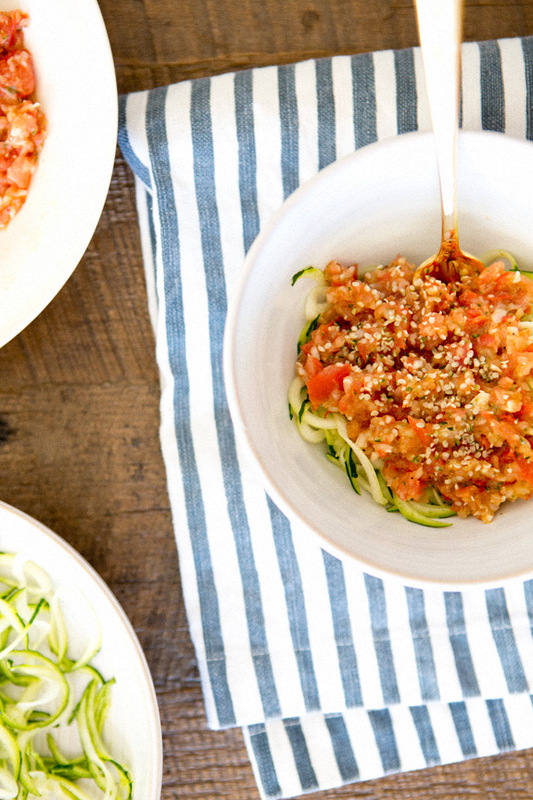 *i like to mix and then store in the fridge for a few hours to let the zucchini absorb all the yummy sauce flavors. 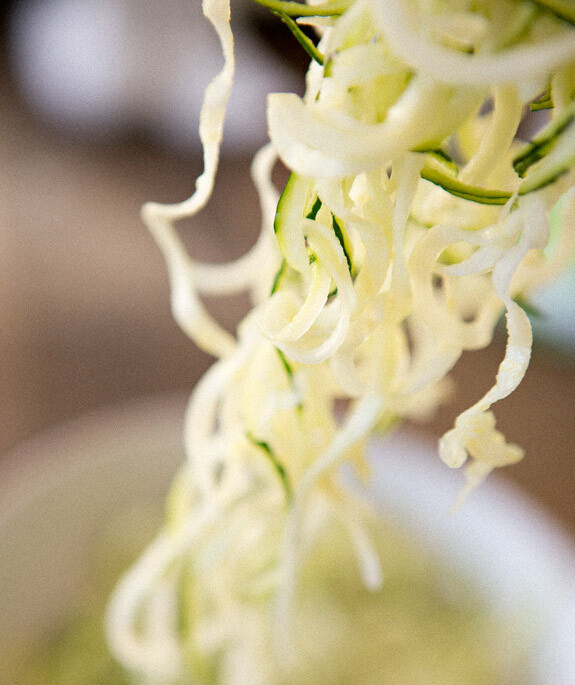 there’s something really delicious that happens when the zucchini noodles soften and are soaked with the sauce! I love the sound of this, but you are right, I have been craving warm things. My body, on the other hand, wishes I ate more raw things! I love spaghetti squash instead of noodles for a base. If you are looking for a warm version of this, try a spaghetti squash! @ patti- it's crazy easy! try it! @jessica and krysta- yes, i love spaghetti squash too! i haven't had it raw though, have you? i'm really loving the way eating lots of raw veggies makes me feel. but next time i need something warm and hearty spaghetti squash will be top of the list! i love zucchini pasta! when i'm craving something warm, i just warm up the sauce or throw it in the skillet quickly. 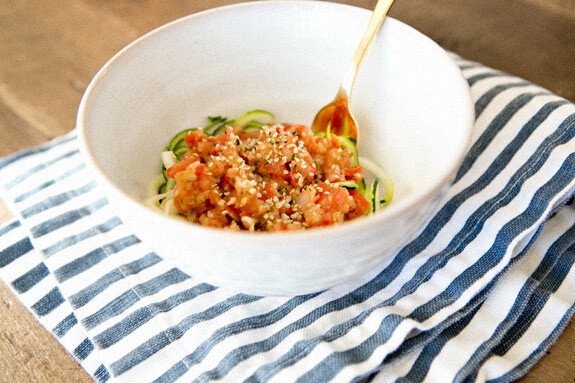 it is obviously no longer raw, but still tasty and far healthier than regular pasta. and i'm of the belief that if you basically just get it warm, you aren't really depleting ALL of the nutrients… but that is just me! it's also great topped with nutritional yeast to really get the spaghetti feeling! i make these "noodles" all the time! i like mine with a cashew cream sauce and grilled shrimp. the best!! This looks soooo yummy! I just started going towards complex, whole grains (staying away from white flour and processed) and trying to eat more raw. So please continue sharing! And I definitely think I need a spiral slicer! This looks and sounds absolutely delicious!!! I am adding it to my must try recipes! So colorful and healthy! Perfect lunch! You've just made me super duper hungry. I really love your posts. Hope to read more of your favorite dishes. This sounds so tasty and comforting! The photos definitely make it look tempting. This dish sounds amazing! I would never have thought of this but am definitely going to give it a try, thanks for sharing!